The Rapid River Lodge is fabulous place for 18-20 people. A family vacation, group of friends, corporate event, a retreat, anniversary celebration, a place for your out-of-town wedding guests, a place for your bridal party or a VERY small wedding or family reunion (60 people or less) is wonderful. The space is ideal to rejuvenate and reconnect. This is a comfortable place where 18 people can gather around a single hand-crafted table or spread out in small groups around 6+ small gathering areas. Children have plenty of room to play. Listen to the Rapid River Falls along the 80' deck. Rustic Decor. High ceilings. Large, open kitchen, plus 2 bar and deck areas. 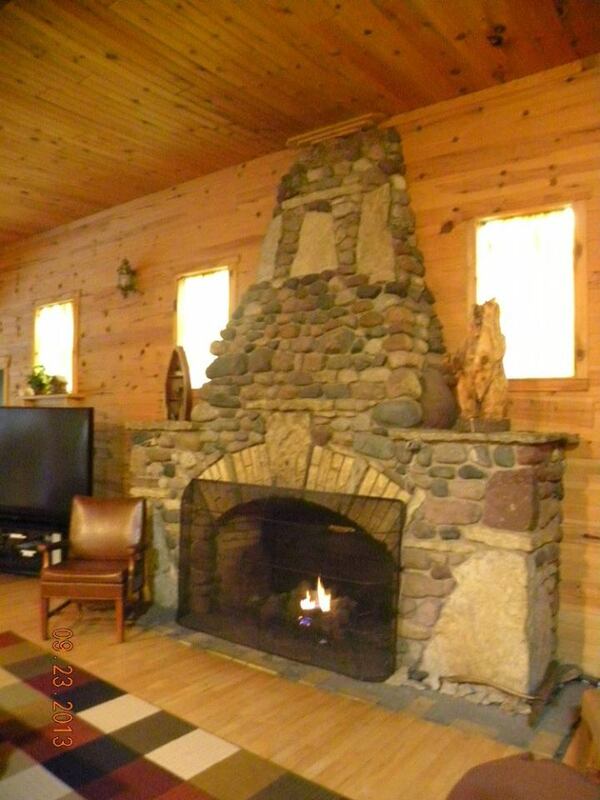 A gorgeous natural wood-burning field stone fireplace warms the sitting area. 1 wood-burning stove. TV/DVD/VCR. Simple bumper pool table, air hockey. Master bedroom overlooks the Rapid River and has a private deck entrance. Large outdoor fire pit along 1/4 mile of secluded river front. Business retreats/events: We do have a pull-down screen hidden in one of the beams in the living room (former dance hall). Also, we do have a projector available, which you can use to project images from your computer. Just ask and we'll make sure it is available to you upon arrival. Cell phone service: Generally, cell phone service stinks at the Lodge. In our experience, Verizon is the best at the Lodge. AT&T is nonexistent. Sprint used to be nonexistent as well, though I have heard it has improved. Hence, we provide a free land line phone with unlimited local and long distance service during your stay. Future Dates: We will start working on 2020 reservations in September 2019. Guests who have currently reserved the weeks have priority. We try out best to accommodate everyone to the best of our ability. You are welcome to let us know the dates you are interested in, and we'll put you on the list. Thanks for your patience as we work through the many variables. We thank you for your business. Grocery Stores: The closest convenience store is just 7 miles south of the Lodge, in the gas station on the corner of US 41 and US 2. The closest full-service grocery store is in Escanaba, about 20 minutes southwest of the Lodge. (Elmers, Wal-Mart, Save-A-Lot). The closest Whole Foods-type grocery store is 40 miles North of the Lodge in Marquette. It's called the Marquette Food Co-Op. It's tiny in comparison to a big city Whole Foods, so don't be surprised. Still, you should be able to get the basic, natural foods you'd need. Pets: *Pets are welcome! Freshwater Vacation Rentals currently charges $50/per pet. Still, the Lodge is not an ideal place for dogs. We do not have a fenced yard at the Lodge. There is a road in front of the Lodge (S15 Road) where I've witnessed drivers driving faster than is safe. It is important to me that your pets are safe. Plus, there is a park next to the Lodge. Our dog used to love to meander over to the park as well. It wasn't a relaxing place for me with a pet. Therefore, I can not recommend dogs at the Lodge. Pictured Rocks National Lakeshore: is 60.6 miles away and about 1 hour and 22 minutes. 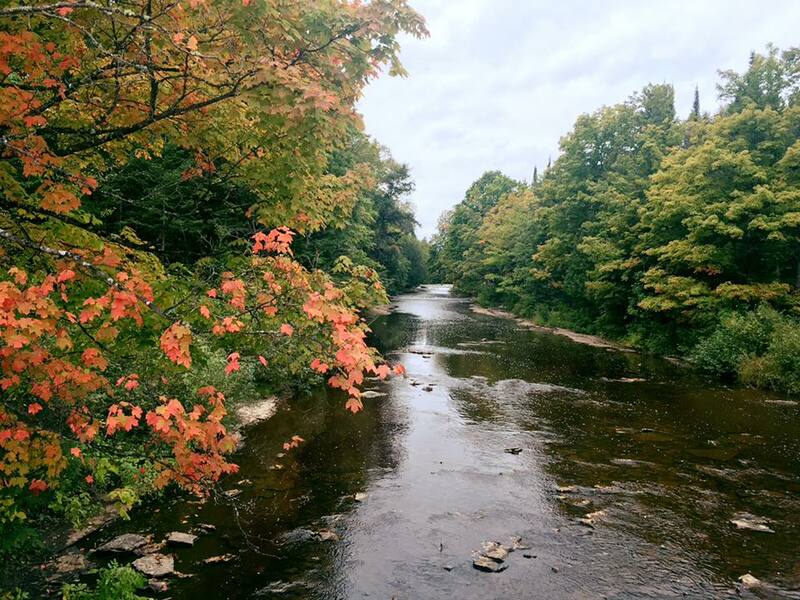 Tahquamenon Falls State Park: is 127 miles away and about 2 hours and 17 minutes. Mackinac Bridge: is 140 miles away and about 2 hours and 32 minutes. Weddings: 60 people is the maximum we can allow for a nice experience for everyone. Due to past challenges, we can no longer offer exceptions to this number of people. If the number exceeds 60 people, you will have broken the rental agreement and you will need to leave the property immediately. The Lodge is NOT an empty hall. Therefore, there is furniture and other pieces which made it comfortable for family gatherings. Yes, back in the day, the Old Dutch Mill was a dance hall similar to VFW halls today. I love the history that the Old Dutch Mill/Rapid River Lodge expresses. Still, with the addition of the 5 bedrooms and 4 bathrooms, it is impossible to offer the same hall experience. It's equivalent to pushing a square peg into a round hole. Air Conditioning: The air-conditioning at the Lodge contains 2 window units in 2 of the bedrooms. 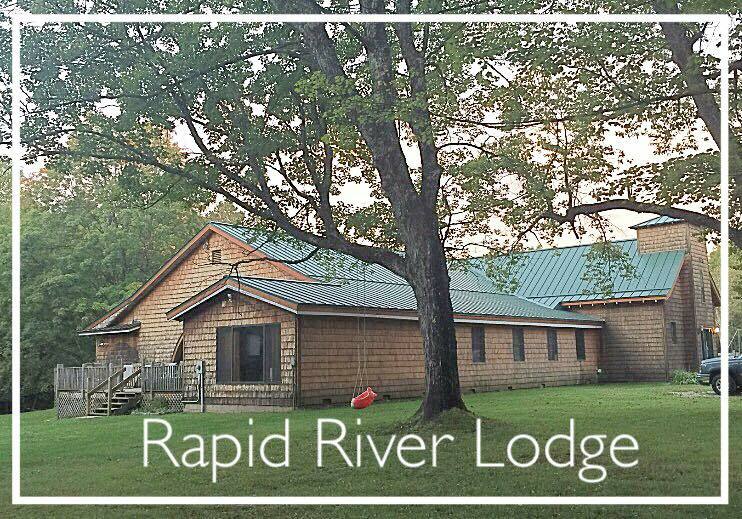 There is NOT central air-conditioning at the Rapid River Lodge. We do have additional box fans, as well as the 9 ceiling fans for your use. Beds/Bedrooms/ Sleeping Arrangements: We have 13 beds at the Lodge, and sleep 18-20 people comfortably. There are 5 bedrooms and 4 bathrooms. A simple bedroom layout graphic is available. Just ask. Simple linens are provided with each bed: pillow with pillow case, mattress pad, bottom/fitted sheet, top sheet and a blanket and/or comforter. Additional linens and blankets may be found throughout the Lodge. 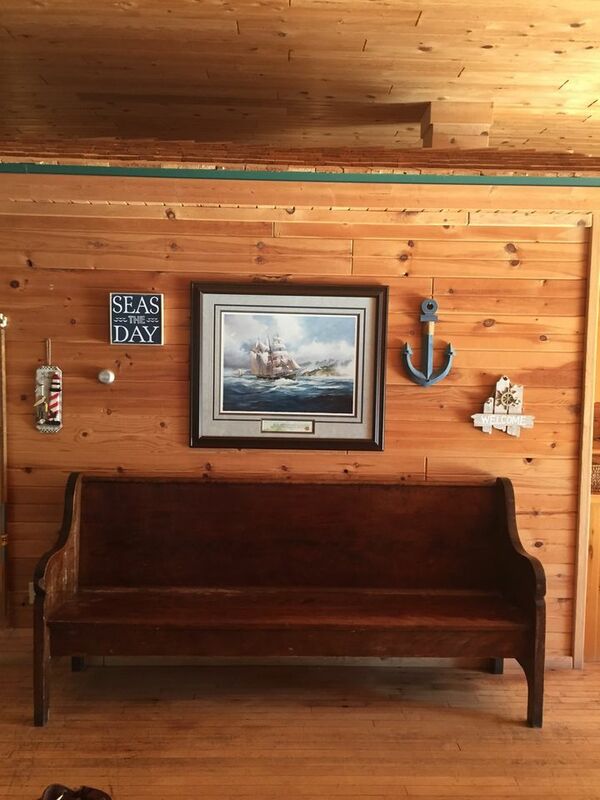 There is a full-sized pull-out couch. Daily Housekeeping Service: We can provide daily housekeeping service (making beds, doing the dishes, basic bathroom wipe-down and floor sweep) for an additional fee of $50-60/day, depending on the distinct needs of your group. Internet: YES, we have added Internet to the Lodge. Free WI-FI. We recently added a 2nd service to cover the back bedrooms. 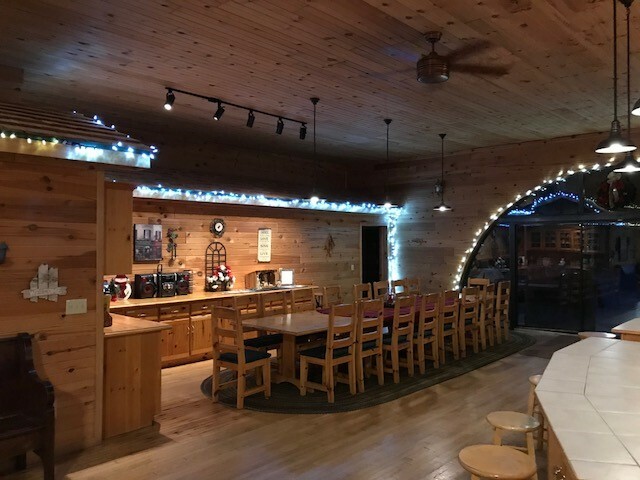 Lights: We are working diligently to update and improve the overhead lights in the dining and kitchen areas at the Lodge. Therefore, we have extra mobile lighting if you need more direct lights during your stay. TV/Cable + DVD/VCR players: Yes, we have basic Dish Network (satellite) with both local and cable channels. We have a large 55" TV in the living room, with a standard DVD player only. Bring your Netflix account info to sign in. If you don't have Netflix, feel free to call our office from the Lodge phone and we can give you ours Netflix account info (734) 837-4976. Also, there is a small 20" TV with satellite cable in the king-sized bedroom. There is an old-school furniture-style floor TV in the room with a double bed and twin bunks, yet that only functions with the VCR and DVD player. We gave an assortment of VHS tapes and DVDs for your enjoyment. Coffee Pot: We have a restaurant-style Bunn Coffee maker at the lodge with multiple carafes for your coffee. We have at least 1 additional standard coffee pot as well. Dishes/Silverware/Cooking/Baking/Glasses: The Lodge is fully equipped for all of your basic needs, and most of your other cooking needs as well. The kitchen prep area is so large that at times it is difficult to find everything. We generally have dishwasher detergent and dish soap for your use. Still, if your family is large and you use all the provided dish soap and need more, the best place to find soap is in Escanaba, about 20 minutes west of the Lodge. Refrigerators: Yes, we have 2 refrigerators at the Lodge. One is a freezer-less refrigerator, and the other is a standard refrigerator. We do NOT have additional coolers at the Lodge. Please bring your own coolers. Roaster: We have an electric roaster for your use at the Lodge. Stove/Oven: We have a standard stove-top with 2 ovens below. One is smaller, more of a pizza-size. The other is standard. Tables: The beautiful large wooden table seats 18 people with the padded, wooden chairs. We also have the following extras (the exact number may fluctuate a bit) Banquet/Sewing/Scrapbooking Tables 17- 8' x30", 1 table 6'x 36", Standard table height 36"
Fireworks: Please check the fire danger status before you consider using legal fireworks at the Rapid River Lodge. Only legal fireworks are allowed. You are surrounded by a forest. It is your responsibility to be safe. Please be especially cautious around children. Please dispose of all wrappers, sticks, etc. Lawn Chairs: How many? 4 rocking chairs on deck; 4 wooden chairs around fire pit. A few additional lawn chairs on the porches. Probably best to bring your own lawn chairs. Projector: We have a simple projector you can use with a compatible lap top to show presentations or slide shows during your business retreat. tiny wedding, or just your fun family vacation pictures. We keep this in the back room, so please let us know if you need it left out for you and your family. 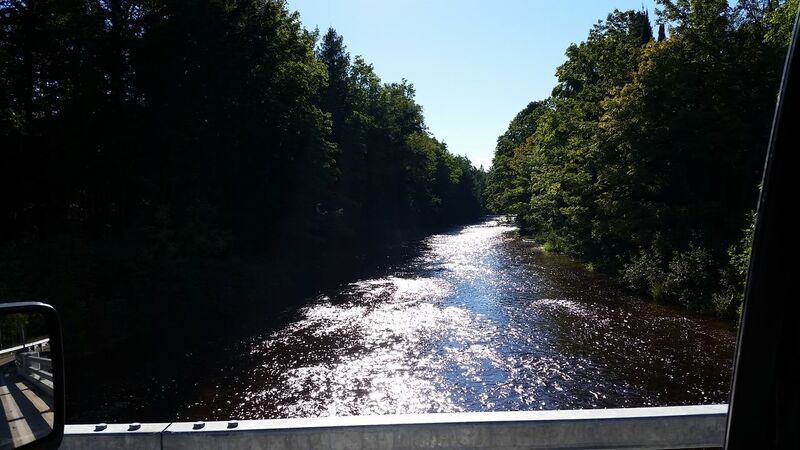 River: The Rapid River is directly in front of the Lodge. It does have a current. Normally, it is about 1 foot deep. Over the past 7 years of owning the Lodge, it has been as low as 6 inches and as high as 3 feet. Lodge was perfect! Plenty of space, beds, essential toiletries, kitchen/cooking supplies so much more than we were expecting. The hot tub was awesome, river view was beautiful, plenty of deck space, gas fireplace was cozy. Great place to gather with family and/or friends! Bi-Annually my team o0f managers that work in both MI and WI meet mid way to align and have our meetings for the year. We have found a gem of a location offering both plenty of area to work collectively, or to break into teams to work on projects. The staff and management of the location is always very helpful and engaged on offering a level of service expected and even exceeded. Bring your family, your business, or just yourself. Wonderful stay, wonderful place. This place is huge. The rooms are well laid out, and have plenty of space. the blankets looked a little aged so we started off by washing the bedding that was on the beds, but I usually do this. There was enough room for us all to do out own thing in the cabin, and not bother anybody else, but when food was ready we had enough room to comfortably eat. The hot tub being broken was a bummer. We really looked forward to using it. Nothing else was below my expectations besides aged blankets and a broken hot tub. I didn't get to explore the whole 40 acres but I'm sure it was beautiful. Accommodated our 24 person Company Christmas Party with no problems. More than enough room for large gatherings. Hearing the river from the deck is amazing. 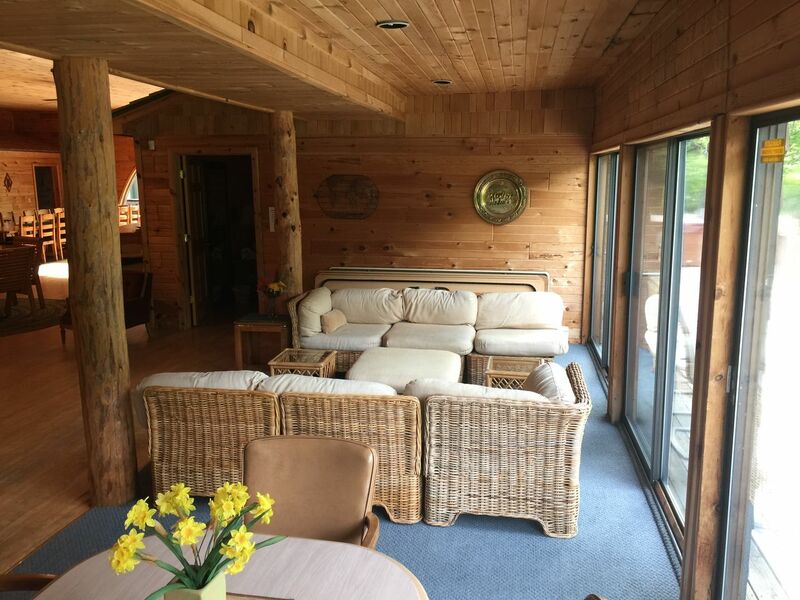 Quiet area, lodge life feel, reasonable pricing...Cant beat it. We would like to make this a annual stay. Everything was excellent. 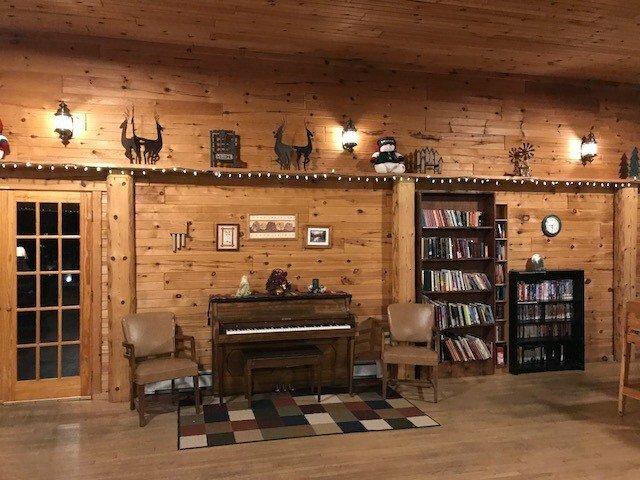 We went to the lodge under previous ownership many years ago, and decided we wanted to go back and show it to the next generation. They were wonderful to work with, and so accommodating for our large family! We had 27 people, and we were able to get everyone a bed. Large space for big families and lots of space for little people to roam around without hurting anything. 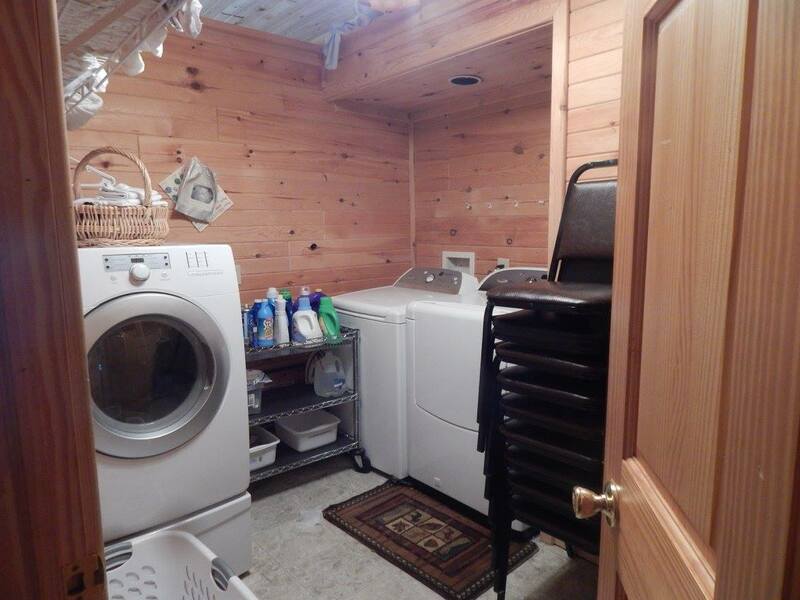 Had almost everything you would need in the kitchen, and made some wonderful updates with more fridge space, a hot tub, nice grill, and so much more. Many more wonderful memories made, and we will definitely include coming back here in future vacation plans!